A dog barks at everything he loves—a cat, a squirrel, and his favorite boy! This Level A book is perfect for new readers. I see a cat. I see a bird. I see a fly. Easy-to-read text and fun pictures follow a dog through his happy day. Sitting inside his house, the dog watches other animals pass by the glass door . . . until his beloved boy comes home, and the two pals dash outside, determined to get up close and personal with all the backyard wildlife! Level A books, for early kindergarten, have one short sentence that repeats on every page with only one word change per spread. Images help tell the story—leading to faster decoding of sight words. This proven method starts the earliest readers on the path to reading fluency. When Level A is mastered, follow up with Level B. The award-winning I Like to Read® series focuses on guided reading levels A through G, based upon Fountas and Pinnell standards. Acclaimed author-illustrators--including winners of Caldecott, Theodor Seuss Geisel, and Coretta Scott King honors—create original, high-quality illustrations that support comprehension of simple text and are fun for kids to read again and again with their parents, teachers or on their own! 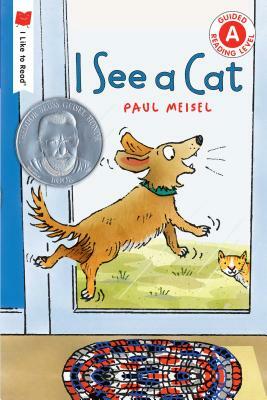 Paul Meisel is the author and illustrator of two Theodor Seuss Geisel Award Honor books, See Me Run and I See a Cat, both I Like to Read® books. He is also author and illustrator of See Me Dig, a Kirkus Reviews Best Book and See Me Play, also I Like to Read® books. He has written and illustrated nonfiction in the Nature Diary series: My Awesome Summer by P. Mantis (AAAS Excellence in Children’s Books Finalist, CCCB Best of the Year List, Science Best Books for Curious Kids, Virginia Readers’ Choice) and My Happy Year by E. Bluebird (a JLG selection). The Schmutzy Family, written by Marilyn Rosenberg and illustrated by Paul Meisel, was a National Jewish Book Award Finalist. Paul lives in Connecticut.